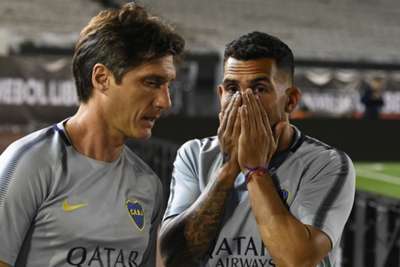 Carlos Tevez is on the bench for Boca Juniors as they prepare to face River Plate in the rescheduled second leg of the Copa Libertadores final. With Boca having drawn 2-2 at home, the second leg was postponed after an attack on their team bus outside River's El Monumental stadium. CONMEBOL have moved the match to Real Madrid's home, the Santiago Bernabeu, with the game finally set to be played 15 days after it was initially scheduled to take place. Tevez, though, is only on the bench for Boca with head coach Guillermo Barros Schelotto instead opting for Cristian Pavon and Dario Benedetto in attack. Captain Pablo Perez is also in the Boca team after he was among the players to have been hurt in the bus attack, which led to his club demanding River's explusion. River start with Lucas Pratto as their main attacking threat after he scored the first goal for Marcelo Gallardo's men in the opening leg.